Foshan has the option to be world's first city that has realized an international orientation standard, an idea from a Munichian inventor to simplify and harmonize worldwide all orientation means: signage, cartography, postal codes, navigation devices and verbal expressions. 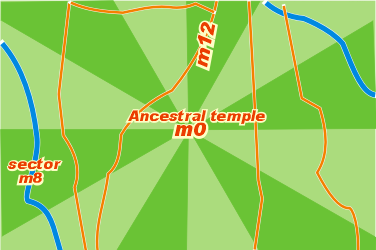 An outstanding point as e. g. the Ancestral temple was (will be) defined as a pole m0. Around this pole, the horizon is divided in 12 "horizon hours"
, whereas m12 points to north. This divides the city as a cake in 12 imaginary sectors. As an example, the sector m8 was marked. The sectors are divided in horizon minutes. These are not angles but DISTANCES to the horizon hour, in steps of approx. one "block of houses" or 100 meters. Example m3:25 ( read "emm 3 point 25" or "emm three 25" ). 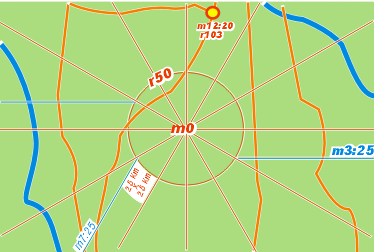 This is a line situated in a distance of 25 x 100m from the horizon hour m3, which points to sunrise. l o g i c a l and easy understandable p o s i t i o n codes. A map with such a polar grid has innovative characteritics, see www.volksnav.com/map . Please be aware about the fact that if the target isn't on map, with the help of the logical position code it's possible to imagine where it is situated !! 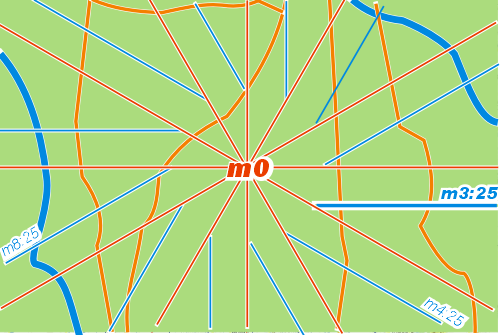 - the search grid contains quadrangules similar to the conventional ones. The picture above shows a white quadrangule with the dimensions 2,5 km x 2,5 km. The bended sides let know in which direction the urban pole is situated, even if the centre isn't on map. - the width of the sector is half the radius !! Example: m7:25 r50, m7:50 r100 etc..
StatusQuo© addresses will be integrated within the existing signage, see www.volksnav.com/lollipop, or be indicated on so-called Orientators©, the signage of the future. Beginners have to turn physically, after some exercises anyone will be able to do this by his imagination power. In case you look at above shown Orientator©, you'd have to turn to left, correct? must I move inwards or outwards? must I move to “later” (clockwise) or to earlier? This may seem to be unfamiliar, but the orientation based on cardinal points is used for some thousand years and imaginary clocks are used by soldiers, boy scouts, pilots, blind people etc. for more than 100 years. In a real situation, VolksNav© can be learned within few minutes, that means, faster than the most seeking times. Then you'll be able to navigate everywhere as elegant as around the Christus statue in Rio de Janeiro, where the idea of a quantified polar orientation and an orientation standard was born.